On 4/16/2012 Larry Taylor wrote me about the 'Secret Service" scandal. He thought something didn't quite fit and suggested the following list: Obama, Colombia, USA, Congress, Coup, Scandal, military, Secret Service, Cartagena, and other any other items that I might consider. On the matrix below the axis term is COLOMBIA at its third lowest ELS. Parallel to it at twice the skip of COLOMBIA is OBAMA with FALSEHOOD at the same skip as OBAMA, but in the opposite direction. Terms at special case skips include HOTEL at skip -1 and the name of the hotel (CARIBE) at skip +1 as well as USA at skip -1. Other a-priori keys words at (non special case skips) include SECURITY, CONGRESS, and PROSTITUTION. BOYS WILL BE BOYS, THEY JUST SHOULDN’T LIE WITH THEM. Does anyone remember James Bond? What about President Clinton, or President Kennedy? Secret Agent James Bond, of course, always got his man in terms of killing him, and he also always got his woman in terms of biblically “knowing” her. Bill Clinton could trust his secret service agents to keep his affair with Monica Lewinsky a secret until he was exposed by the famous blue dress. President Kennedy also took advantage of at least one White House intern, and there are stories about many women (including Marylyn Monroe) who kept him well entertained in the White House Swimming Pool. Ditto for President Franklin Roosevelt.and possibly Dwight Eisenhower. But along comes President Obama, and military heroes and secret agents suddenly find that while homosexual behavior is to be tolerated, they can no longer let off heterosexual sexual steam, even when out of America in a country where prostitution in legal and the President is not yet in the nation with them. This does not mean that I approve of their behavior in Colombia. Those who were married and who cheated on their wives definitely placed themselves in compromising positions where they might be subject to blackmail. However, for those who were single, did not get drunk, and who did not create a scene by refusing to pay the requested $150 for services rendered, I see no crime or reason to dismiss them. They were just doing what millions of their buddies have done before. As for the payment dispute, on CBS news on April 18th it was said that the agent involved did not know that the woman he spent the night with was a prostitute until she demanded payment in the morning. I do not recall seeing any vowels of celebacy required for our warriors before. How long have men been behaving this way? The story of Judah and Tamar found in chapter 38 of Genesis is most instructive. Judah thought he was hiring a prostitute (who turned out to be his daughter-in law, the wife of his deceased son Er). When he could not find her to pay her, problems ensued. If you don't know the whole story, there is a description of it here, but it is noteworthy that both Judaism and Christianity agree that the Messiah descends from Judah. STATISTICAL SIGNIFICANCE OF THE MATRIX. As per my standard protocol, no positive statistical significance is assigned to the axis term, here COLOMBIA at its third lowest skip in Torah. For a matrix with 8 key a-priori words, the significance might be expected to be a bit higher than what I found. The matrix appeared against odds of about 3,106 to 1. 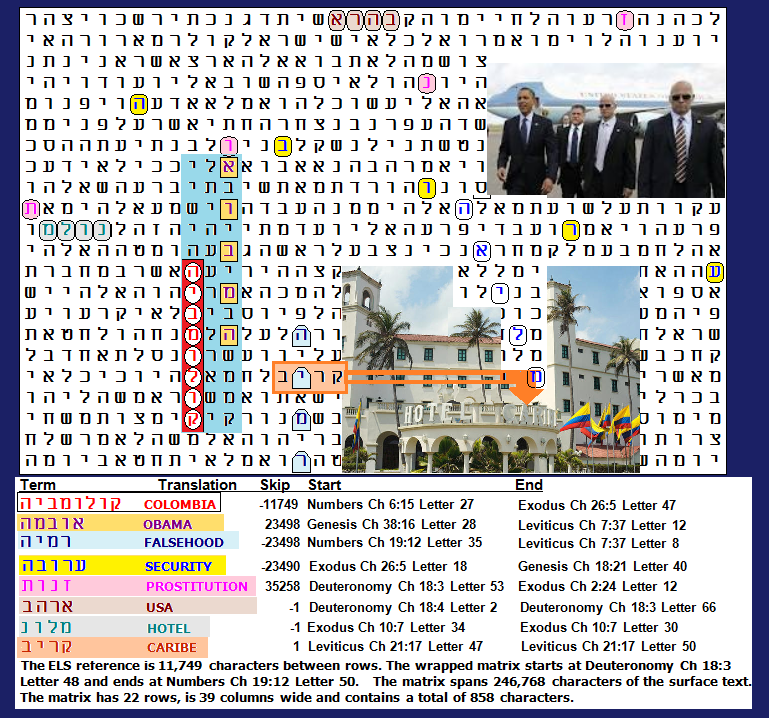 However the structure of the matrix is better than these simple calculations accounts for because it does not assign extra value to either OBAMA or FALSEHOOD although they are parallel to COLOMBIA. 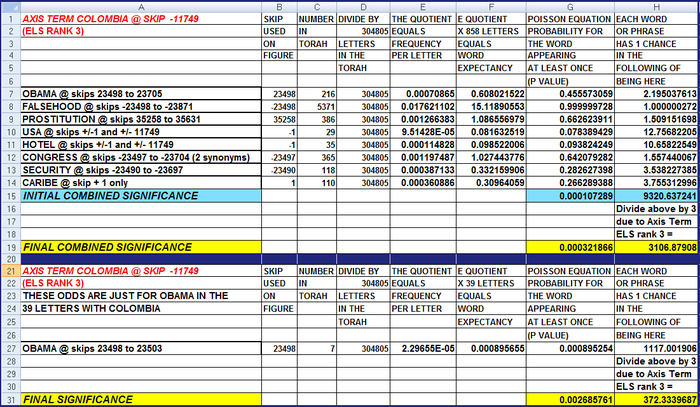 OBAMA had about 1 chance in 2 of appearing 858-letter matrix at any skip, while FALSEHOOD was virtually certain to be somewhere on the matrix at any skip, however the name of the hotel (CARIBE) at skip +1 ran through and shared a letter with FALSEHOOD, a fact that is not accounted for by my standard statistical calculation protocol. 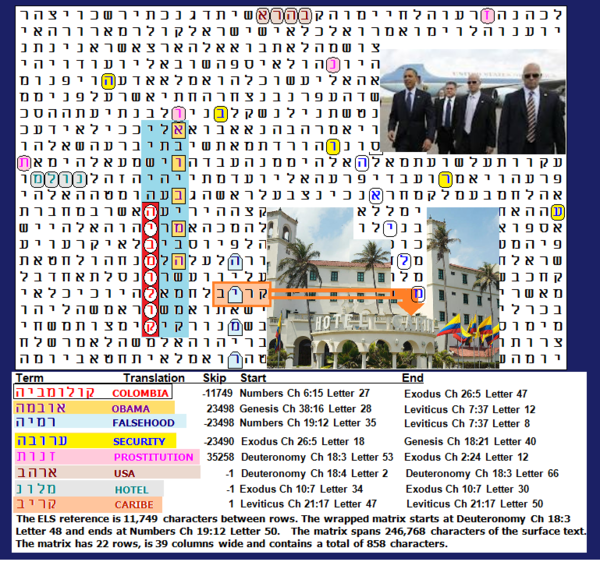 To show just COLOMBIA and OBAMA takes only 39 of the 858 letters on the matrix (see the area highlighted with a light blue background). Odds against COLOMBIA and OBAMA being this close are about 372 to 1. CARIBE at skip +1 only turned out to be on the matrix against odds of about 3.75 to 1. HOTEL at skip -1 was on the matrix at a special case skip against odds of about 10 to 1, while USA at skip -1 was on the matrix at a special case skip against odds of about 12 to 1. CONGRESS and PROSTITUTION were not at special case skips, and each was on the matrix against odds of just about 1.5 to 1 (not significant). SECURITY was on the matrix against odds of about 3.5 to 1. I don't see any evidence here of an attempted coup, but the general nature of the incident seems to be here. It is, of course, possible that there is an unseen key word that would greatly jack of the statistical value of the matrix.